In this post, I am going to implement a RecyclerView with multi selection feature. In multi selection, user can select multiple items from RecyclerView. Suppose there is a model class called Item which holds name. We need to modify our Adapter to keep a list of selected elements and a list of all elements. Now lets see the Adapter. 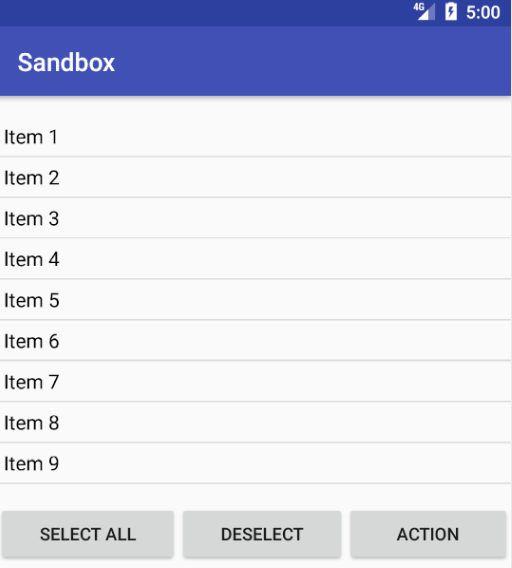 Since API 11 (Android 3.0), ListView and GridView provide a special mode called CHOICE_MODE_MULTIPLE_MODAL that handles this automatically. 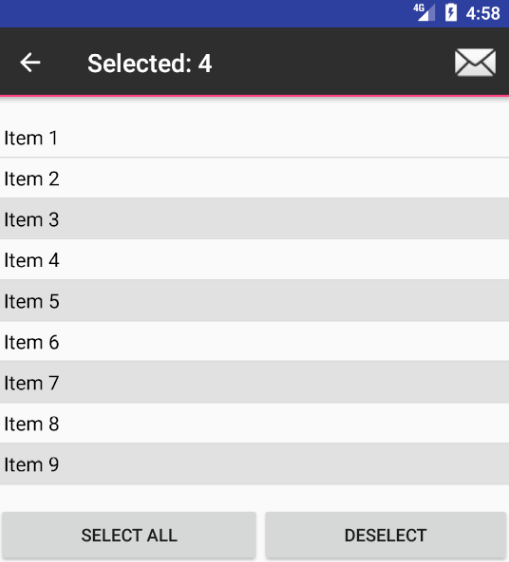 When you enable this option, the user is able to long-press a list item to switch the ListView/GridView to a selection mode, then select more items with simple taps. While in this mode, the ListView also launches a contextual action mode showing the possible contextual actions on top of the App Bar. Closing the action mode or deselecting the last item switches the ListView back to normal mode again. In contrast, RecyclerView provides no built-in selection mode at all, since its purpose is to be as simple and modular as possible. If you want to invoke the contextual action mode only when the user selects specific views, you should implement the ActionMode.Callback interface. In its callback methods, you can specify the actions for the contextual action bar, respond to click events on action items, and handle other lifecycle events for the action mode. Following is layout for cab_menu.xml.